Next Level is the maternal brother to the 2015 National Western Stock Show Grand Champion Polled Bull, Full Throttle, the 2014 Jr National Grand Champion Owned Horned Female for Cassidy Hanson, the 2014 National Western Stock Show Reserve Grand Champion Polled Female and the 2013 Jr National Reserve Grand Champion Owned Polled Female for Trent Ray. His dam, Sweet Red Wine, has generated over $500,000 in progeny revenue in the last year alone. 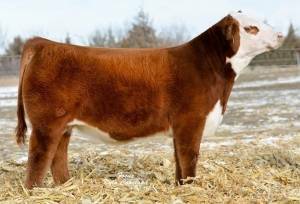 A flush on Sweet Red Wine brought $48,000 this year at Denver in the Embryos on Snow Sale! Next Level is the logical sire to use on About Time and 88X influenced females. Next Level is clean and extended in his front end, balanced from end to end and exhibits a tremendous amount of length and style with a big hip and wide top. He offers a tremendous EPD profile to complement his look with huge growth numbers coupled with outstanding carcass and maternal numbers. Let him take your program to the Next Level!